There will be much to see and plenty of action. The pair of mighty Z7 ploughing engines will be using the balance plough as they were designed to do. The engines sit at opposite ends of the field and winch the plough back and forth between them. Demos in the rear paddock at 11am and 3pm weather permitting. 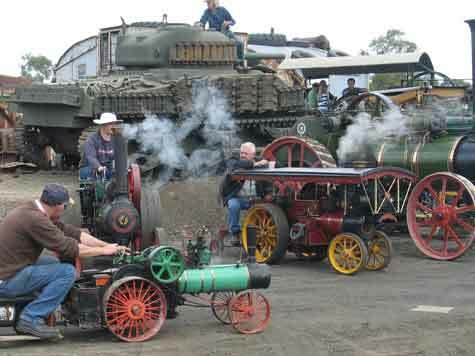 Steam traction engines, steam rollers and steam trucks will all be out and running. This year a circuit track has been set out to steam the engine around the rally site. After the grand parade the engines are lined up and there will be an opportunity to inspect the engines close up and chat with their drivers. The miniature railway and tractor drawn people mover will be busy giving rides for all. The grounds are quite extensive so a ride on the train or people mover is a good way to get the top paddock. Start and stop your favourite engines to control their run around the tracks. The Heritage Draught Horse club are very popular exhibitors at Steamfest. The club's large grounds provide an opportunity to see these magnificent beasts performing farming duties. You can take the miniature railway or the people mover to save your legs on the way up to the back paddock. Bigfoot the walking dragline will be putting on a demonstration at 1:30. At 2:30, after the grand parade, there will be a chance to walk through and view it from the inside. Over the last decade the club has built up an impressive collection of earth moving machinery. The Morris family will be putting on a great display in the back paddock with diggers, graders, draglines and bulldozers and a dump truck. All those classic sandpit toys in full size playing in the dirt. catch the miniature railway or the people mover to the back paddock to save your legs. The club's impressive diesel engine collection will be performing all weekend. Try and catch the big engines starting up. Start up and running times are displayed near the engines. Be sure not to miss the intricate reproductions of machinery from the museum constructed from old redgum fence post's! Thomas the tank engine fans will enjoy the model railway. A number of portable steam engines are on display. Having its first run this year is the newly restored Melbourne made Johnson portable. Portables include the Shand Mason fire pumper (Sunday only) and a Melbourne manufactured Herbert Thompson engine. It all looks much more interesting when you see it working. The club's philosophy is to be a working museum and the aim is to get the exhibits operational. At Steamfest we go one step further and try to demonstrate machinery carrying out the tasks it did in its working days. The package boiler serving steam to the engines in the Stationary Steam Engine Museum will be in action all weekend keeping the magnificent exhibits turning over. There are some great pieces of Victoria's industrial and maritime history on display here and they come alive with a gentle hiss of steam. Steam hammers were once an essential tool of heavy engineering but you are unlikely to see one in operation anywhere but here. Our energetic blacksmith group are progresively bringing an impressive collection of vintage workshop tools online. The little engines that kept our farms and small business running when electricity was not readily available are out and running. The steam engines and pumps that operated the steam tug Lyttelton II are set up to mimic the ship's engineroom. Steam to run the engines is supplied by a Farrar vertical boiler. 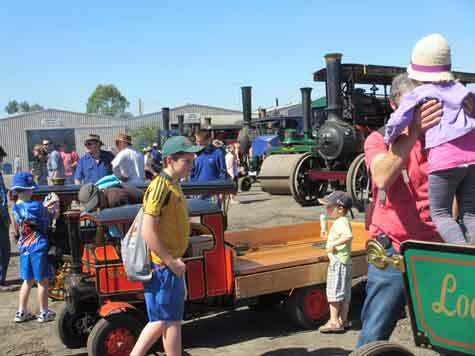 Over the Steamfest weekend the club's exhibits are enhanced by exhibits and displays from other clubs, individuals and community groups with complimentary interests. 2:30 Arena open to public for Up Close look. Parades at 10:30am and 3pm.